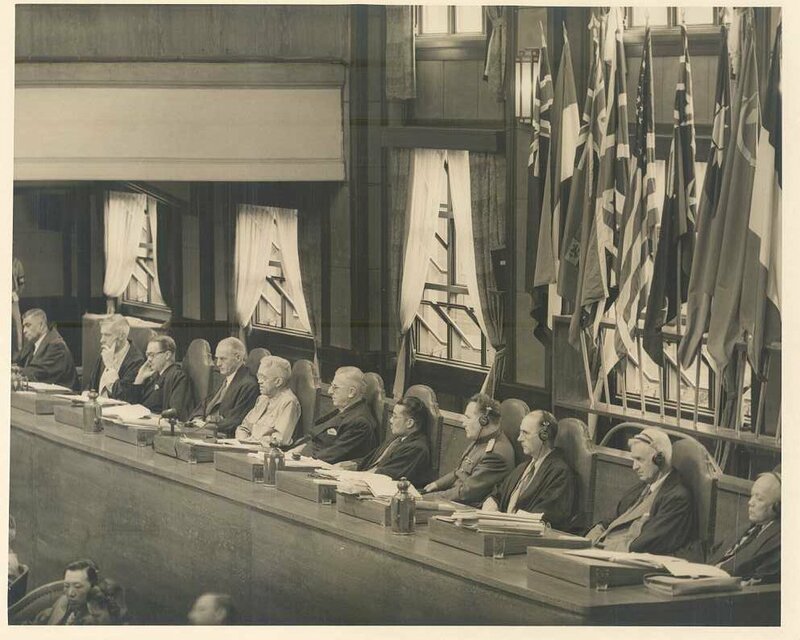 The eleven judge panel for the International Military Tribunal for the Far East. 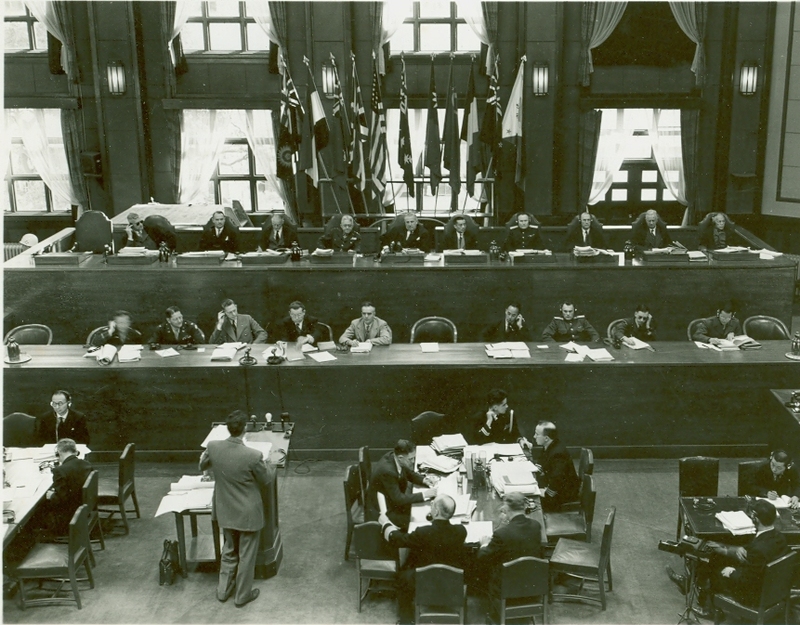 Judges listen to testimony during the International Military Tribunal for the Far East. Lt. 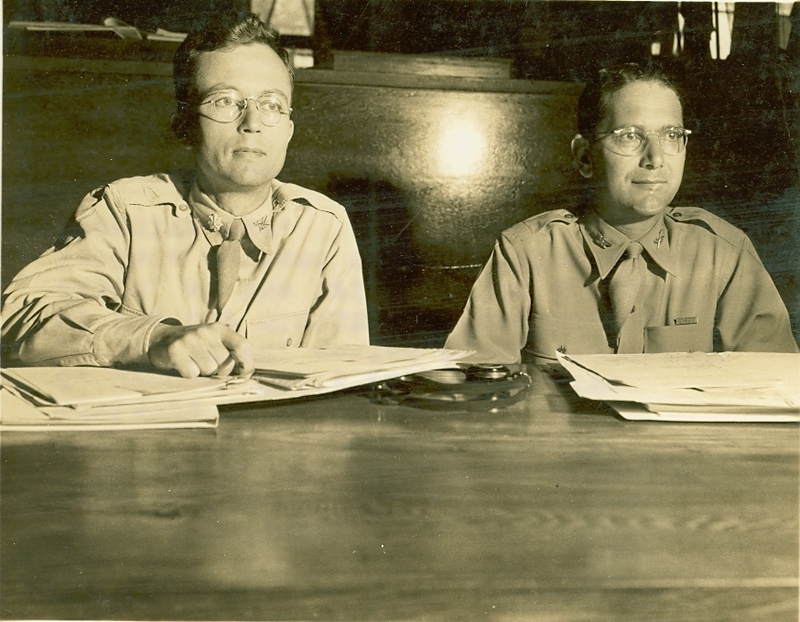 Colonel Kuder and Colonel Hosch during the International Military Tribunal for the Far East. The Tokyo War Crimes Trials, officially the International Military Tribunal for the Far East (IMTFE), was established by a special proclamation of General Douglas MacArthur, Supreme Commander for the Allied Powers (SCAP), on January 19, 1946. The Japanese signatories to the Instrument of Surrender of September 2, 1945 had agreed that war criminals would be brought to justice. The Tribunal convened on April 29, 1946. Using the Nuremberg Trials as a model, the Allies established three broad criminal categories. Class A - Crimes against Peace: Namely, the planning, preparation, initiation or waging of a declared or undeclared war of aggression, or a war in violation of international law, treaties, agreements or assurances, or participation in a common plan or conspiracy for the accomplishment of any of the foregoing. These charges were filed against Japan's top leaders who had planned and directed the war. These individuals were accused of participating in a conspiracy to start and wage war. Generally these were the highest ranking people in the Japanese war machine. Twenty-eight Japanese military and political leaders were charged with Class A crimes and came to be called Class A war criminals. Class B - Conventional War Crimes: Namely, violations of the laws or customs of war. Class C - Crimes Against Humanity: Namely, murder, extermination, enslavement, deportation, and other inhumane acts committed against any civilian population, before or during the war, or persecutions on political or racial grounds in execution of or in connection with any crime within the jurisdiction of the Tribunal, whether or not in violation of the domestic law of the country where perpetrated. Leaders, organizers, instigators and accomplices participating in the formulation or execution of a common plan or conspiracy to commit any of the foregoing crimes are responsible for all acts performed by any person in execution of such plan. More than 5,700 Japanese nationals were charged with Class B and C crimes, mostly entailing prisoner abuse. The Tribunal for the Class A defendants held over 900 sessions, considered 4,356 pieces of documentary evidence, and heard the testimony of nearly 1200 witnesses. The defendants were allowed three or four attorneys each to help them with their defense. They were also allowed to submit evidence and question witnesses. On November 4, 1948, after six months of deliberations and drafting, the Tribunal began reading its decision, which ran to 1,214 pages. During the proceedings two of the defendants died and another became physically unable to participate. Of the 25 remaining defendants, seven were sentenced to death by hanging. The executions took place in the early hours of December 23, 1948 at Sugamo Prison. Sixteen defendants received life setences, two others received lesser setences of 20 years and seven years. The Tribunal adjourned on November 12th, 1948. Click on the title for location and availability.